No one likes doing maintenance on their caches, but it’s a necessary evil. 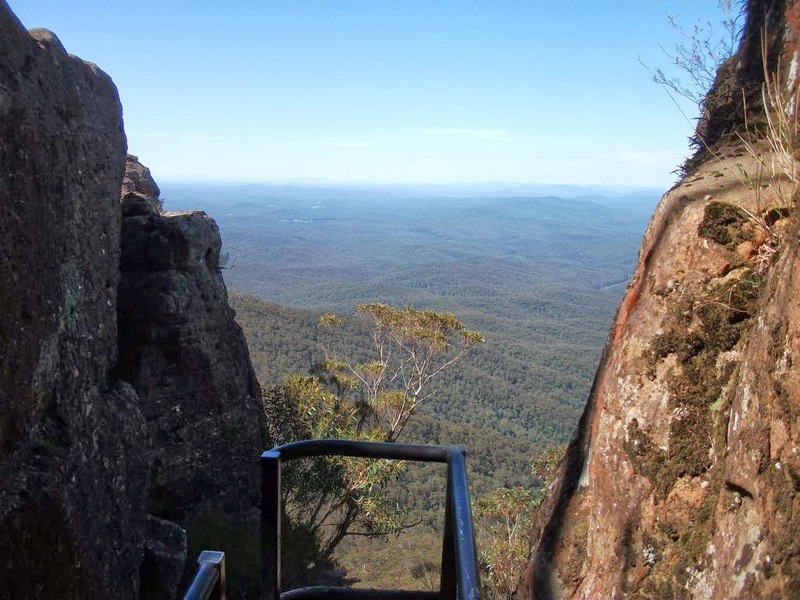 The thought that someone has intentionally trashed (muggled) your cache can be heartbreaking and that feeling swept through me when I’d heard of a few DNF’s on one of my remote caches, but the thought of a bushwalk to the top of Pigeon House Mt certainly put a smile back on my face. 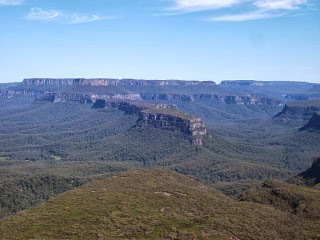 Pigeon House Mountain is located in the Morton National Park, it’s a 35km drive west of Ulladulla, the last 14km being dirt road which generally in good condition. It’d been a few years since I’d walked out here and I hoped recent bushfires in the area hadn’t spoilt the vista. Arriving in the carpark I was pleased to see new facilities and amenities had been provided. There was only one other car in the carpark so I was pretty sure I’d have a nice peaceful walk. A sign at the start of the walk confirmed my cache notes that this is a hard walk of approximately 3-4hrs and a change in elevation of 450m. There is no easing into this walk, straight out of the blocks you head up a very steep section. For me this took approx’ 30min but I’m pretty fit and I know others will take it a little easier than I did. Once at the top of this section you get your first glimpse of your goal. 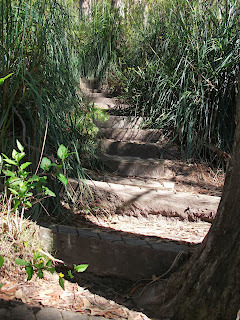 After a refreshing break I continued on along the easiest part of the walk. For about 10-15min you traverse the level plateau through heavily wooded areas where the serenity of the area was broken by the various birds calling. Slowly the track starts to rise up as you being your assault of the cone shaped land mass. Well-constructed timber steps and a good path make the job easier but once again you can really feel your heart beating as climb to the base of the rock pinnacle. It was on this steep slope that I came across the occupants of the other car, these people had obviously made an early start to the day as they were already making their way back to the car. After a quick chat I kept going knowing that I now had the place to myself. 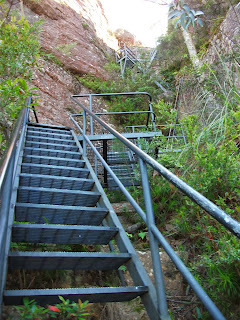 I soon arrived at the first set of ladders and a realisation that I was nearly at the top. 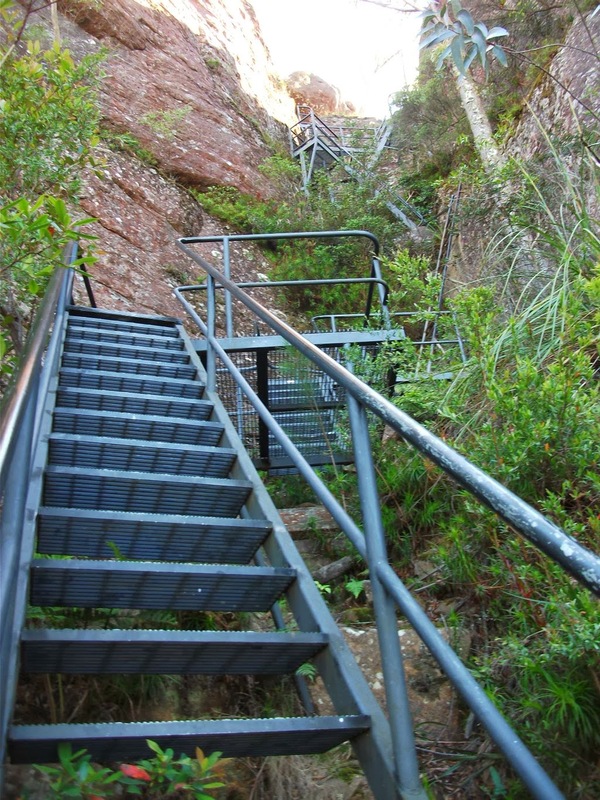 There are probably 8 sets of steep steps and 2 ladders to negotiate, all of which are very secure and safe. Once on top there is a short walk around to the trig and a fenced lookout and the beauty of this place can be realised. From the trig the view in a westerly direction is fantastic. 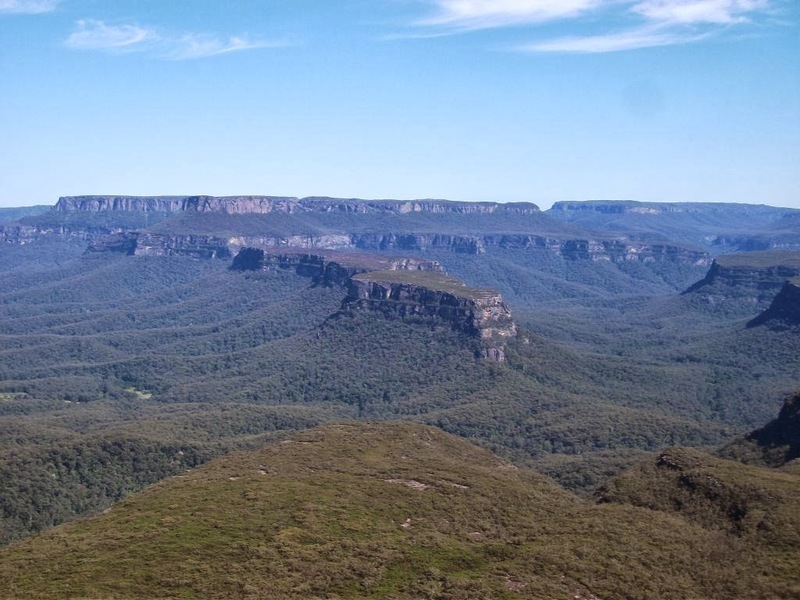 The wilderness area of Morton National Park, The Castle and Yadboro Flat are all before you. In the distance evidence of the recent fires could easily be seen. To the east, the coastal towns of Ulladulla, Milton and Burril can easily be seen. After plenty of photos I set about replacing my muggled cache. I wondered how a cache so remote could be muggled twice in 6 months but this area is too nice not to share with my fellow geocachers so a new container was placed in a slightly different spot. With my caching duties complete and some more photos taken it was time to head back. The ladders seemed a little daunting as you look down on them but they are no problem if you take your time. The up slopes were now the down slopes and its often said its harder on the knees going down and I have to say that was the case for me this time and as always the return journey always feels quicker. 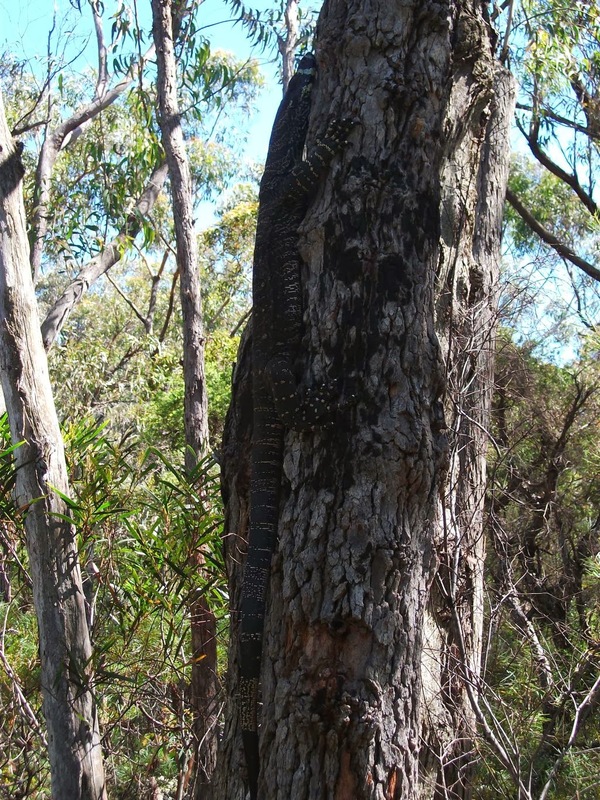 I was soon down the cone slope and moving freely along the plateau when I had an encounter with the wildlife. 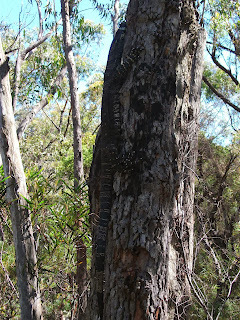 A one metre goanna and I wanted to share the same pathway. Luckily he saw who was the boss and soon moved to the side allowing me to pass. Taking in one final glimpse of my achievement I headed down the steep slope and back to the car. My hike had taken me 2hr 20min which included a 30min rest on top. Those who are considering this walk should easily allow 3hrs, take plenty of water, a first aid kit and your camera with you.